Crossing thousands of miles to go to a wasteland? Bring a towel. Amenities in the region are spare, and power’s either absent at best or unreliable at worst. Lianthe has the best architecture, lowest mortality rate, and it’s closer to actual civilization. Casual visitors: check out the statues on the north, skip Troyalle, and tell everyone you’ve been. Wayfinder will back you up on that. 500 years ago, two swooping lines of shining white towers marked the borders of a great cat’s eye staring toward the Martian sky, but that was a long time past. Now the two wedges of ruined cityscape Lianthe and Troyalle are more of a dirty gray. They’re still majestic, but it’s an ancient, ruined majesty. Both of these ancient corptowns are broadly built on similar lines. The westmost edges line Lake Hallas, a wall of kilometer-high towers once occupied by the social and financial elite of the Bastion corpernation. The eastmost edge is the same, but higher, its buildings rise over two kilometers, so that the highest rooms still have an unbroken view of the water below and beyond. Between the eastern and western walls the buildings dwindle in a gentle curve, so that most of the corpernation once gave the impression of walking down a glittering white valley, some 550 kilometers across at its widest point. The northern territory of Bastion, and the one closest to the warmer equatorial regions (and therefore, closer to the money). Lianthe has aged reasonably well. It’s covered in 200 years of grime, and many of its buildings have been salvaged, but the years have given it something of the look of an ancient cemetery more than a blasted urban eyesore. As the gateway to Bastion, Lianthe’s buildings were spare, tending toward more open areas, parks and civic architecture, and the more expensive corporate offices, particularly in the areas closer to the high walls. Some of the larger statues and monuments still remain mostly intact, if covered in a century of graffiti. The smaller ones were dragged to Sholoban as salvage or weird public art. Cats, everywhere. Bastion was a felidae-held corporation, and that shows in its art, particularly in Lianthe. The statues of great executives, all cats. The wall frescos and subtle white-on-white carvings? More cats. If you’ve got a thing for feline racial history, bring your cameras. There are three reasons Lianthe hasn’t been taken by squatters: firstly, the service grid in the area is flickering and irregular. There are lights on the skyline along a few miles of lakefront property around the offices of the Titan Film Cooperative, but the rest of the grid is more miss than hit. A lot of the juice that could be going to Lianthe is diverted to neighboring Shobolan, and not by professionals. The network may occasionally surge to life at the strangest times (it likes to fire up when Phobos swings past overhead, picking up transmissions from the spaceport; it also tends to perk up during electrical storms), but it’s unreliable and pretty weak. The second is the persistent rumor that the corptown is haunted. This is obviously untrue, there’s no such thing as ghosts (echoes rippling through transcendent realms, sure, but not ghosts…) But enough weird goings on and strange noises have spooked would-be settlers that most people figure there’s easier places to live. Thirdly, Sholoban long ago ended up as the best crash pad in the region. Its consistent and lower-profile architecture and protection from the wind, and its abundant and occasionally edible plant life, made it a more hospitable place to build a community, and as that area became more stable, they managed to scratch together some power and connect to more of the service grid than dead Lianthe did. Without any actual overcrowding, people go where there are people. Besides the Titan Film Cooperative, there are a few other points of interest, or at least conjecture. Spyglass is rumored to have a number of agents in the taller towers of Lianthe’s east bank, keeping a distant watch on the slumbering and/or rotting reaches beyond. As a general rule, if it can be used to patch up a building, the natives will cart it away. Otherwise, it’s traditional to leave piles of stuff moldering as a starting place for next year’s parades. Troyalle is not a place where people live. Even when the corptown still had inhabitants, the southern region was more focused on industry than residential areas or pretty gardens. As Bastion focused its attention more to the space tradelanes and grew away from “corpornation as revenue stream,” more and more of the town and its lakefront spires were converted to industrial blocks. Some of the towers close to the lake are weird half-breeds, luxury residences shot through with massive chimneys and obsolete piping. Others have just collapsed. Toward the end of the 400s, Bastion’s resources began to slip as it went head to head with a new MarsCo-backed organization: the IRPF. Bastion’s board of directors pushed the megacorp’s production into high gear while drawing more and more resources away from infrastructure and repair. The inevitable industrial accidents tore holes in the corptown and left poisons in the water and land that still haven’t faded. And of course there’s the persistent rumor that the corptown is haunted. This may or may not be true, depending on how one defines “haunted,” but it’s definitely not a good place to be after dark, and the tainted land, chill southern winds, and total lack of a power grid have made it not a good place to be, period. 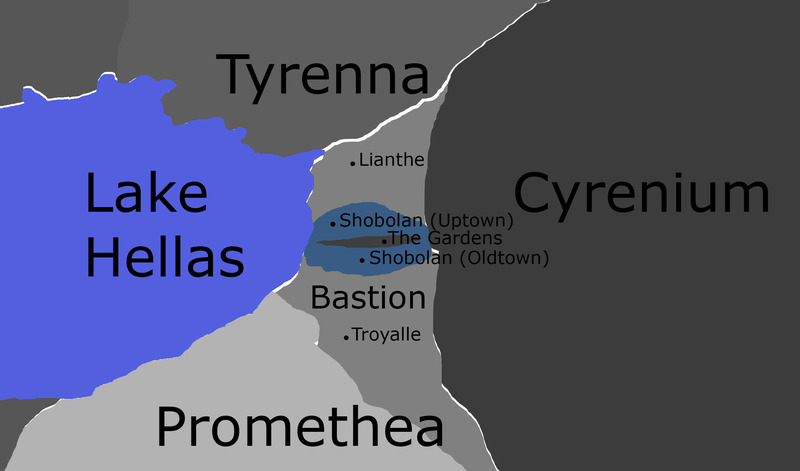 As mentioned in “Shobolan,” the corptown of Troyalle is a silent war zone contested by two deadly predators: a trio of exonymphs looking to keep their secrets and lives intact, and a colony of palemen protecting their aquatic cousins in Lake Hellas. That’s a lot of monsters, but Bastion is thousands of square miles of ruins. There’s space. A half-dozen vectors lose their lives every year in Troyalle when they’ve accidentally uncovered something bigger and badder then themselves, but it’s usually safe during the day…at least as long as the monsters stay in the south of the region. If they expand too far into Shobolan, it may start a three-front war. ♃ Buried Past: One of the key reasons Bastion took control of the region originally was that it was once held by the deceased megacorp Genotype. Anything that’s easy to reach was confiscated by Bastion long ago, but who knows what relics of biotechnology and pathology are buried in the ice and permafrost? ♃ The Money Pit: A vacant megastructure is the perfect base for an up-and-coming mercenary corp, just like the PCs. It just needs a little love. And a thorough debugging. Oh look, the locals are coming to welcome us…are they bringing a film crew?